Since my post about the boho chic wedding dress collection by Lora Folk for Monoprix, I haven't given you any updates on my big day. I admit that the whole planning process (which hasn't even really started yet) has already become quite complicated. While some people made statements like 'Will you be getting married soon? I know people who've been engaged for ages which is just ridiculous! ', other people told me that I should have a job and a house before getting married. It seems like as soon as you're engaged, everybody has an opinion on how your wedding should look like. Luckily over the last few days I learnt to blend the noise out and concentrate on how my fiancé and I want our special day to be like. How good that I chose two bridesmaids who encourage me in all my choices and wishes. Even though it might still be too early for some serious planning, we've already been visiting a possible wedding location and are having some dates in mind. At the moment however, my main occupation consist in collecting a max of wedding inspiration on Pinterest. As I want the location to match the theme of our wedding, and as I want consistency in the stationery - from "Save The Date" to menu cards - I first want to see what kind of wedding I actually like. So right now I'm trying to figure out a wedding theme that will fit our taste and our budget. The colour scheme of my board is clearly tending towards natural hues like cream, pastel green and light brown. For the stationery I was thinking about doing lots of it myself and thus to work with brown paper to give it a folksy touch. The green will obviously come from the many flowers I plan on integrating in the decoration, and to keep it all simple I will prefer white or light pink flowers. The decoration shouldn't look like in a 5 star restaurant but make our guests feel cosy. Besides the flowers I hope to create this atmosphere with light cloths, candles and personalised details. As I don't want our guests to get bored between courses, I intend to integrate some cute and fun occupations for both kids and adults. Photography will definitely be a major part of our wedding so we will either procure a photo booth, or leave Polaroid/disposable cameras all over the room. I also saw these sparklers on Pinterest and as I've been adoring them as a child I'm sure they will help brighten our party. I find the recent trend of 'naked cakes' super adorable and most people aren't into heavy butter cream or frostings anyway. As these cakes can be decorated with fresh berries or flowers, they would go perfectly with the slightly rustic setting I'm tending towards. I am really picky when it comes to the dining room, which should neither be too modern nor too outdated. I also can't stand dark or too colourful rooms. I am not going to talk about the location we have in mind yet, as we are still looking for other options, but a room just for our guests where no stranger can show up will be highly appreciated. 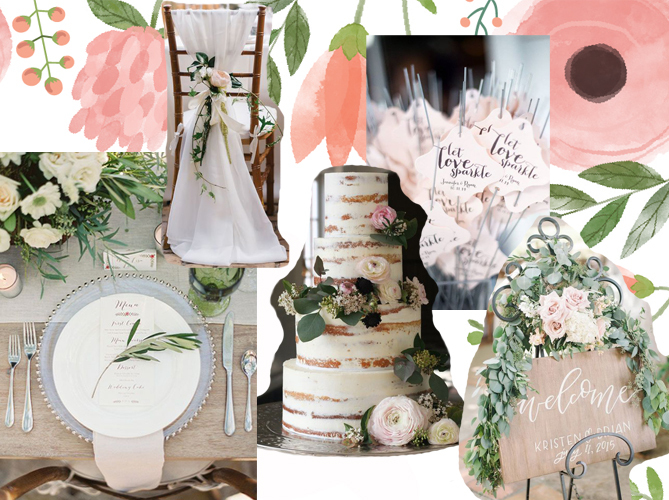 For all of my current wedding ideas (and for the sources of the photos above) you can have a look at my complete wedding board here. Is anyone else currently planning their wedding? I would love to exchange with ladies who are going through the same decisions as I am. To all the married women out there: How did you choose the theme of your wedding?